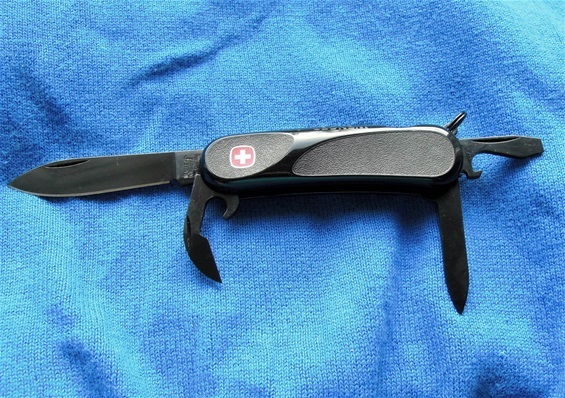 This is my latest Wenger 85mm knife and it is the Blackout 10.X with the grip inlays you find on the EvoGrip knives. I must say it looks completely awesome and I do not believe I have ever seen a better design. It looks like something Batman would have used for maintenance. I got news very early in 2012 about the new Wenger knives with PVD coating. 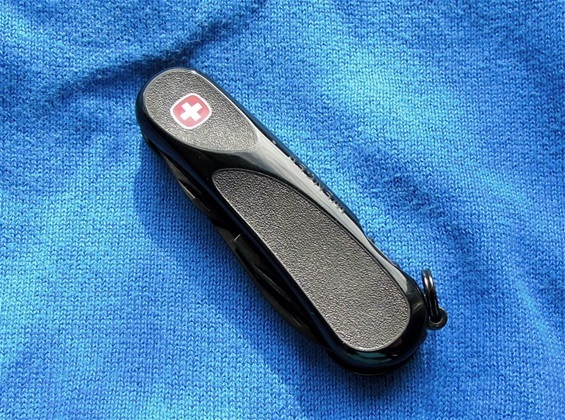 The Physical Vapor Deposition (PVD) has been used in the watch industry and it will provide different abilities on a Swiss Army Knife. It is no doubt that Wenger put much work into this because all the functions, liners, dividers, key-ring and toothpick + tweezers are black. The SAKs already got a good selection of stainless steel but this will increase the resistance and it will provide a dividing layer. 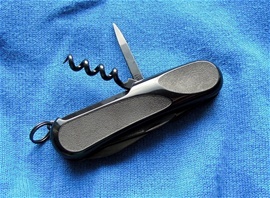 The use of PVD on knives is like Wenger did show very innovative again. My information is that the knives was introduced early 2012, mine is labeled 09 2012 so it is within the year and this is well. Dette er min siste Wenger 85mm kniv og det er en Blackout 10.X med greps innlegg som du finner på EvoGrip knivene. Jeg må si at denne ser helt utrolig ut og jeg tror ikke jeg har sett bedre design noen gang. Den ser ut som noe Batman ville brukt for vedlikehold. Jeg fikk nyheter tidlig i 2012 om lansering av kniver med PVD belegg. Physical Vapor Deposition (PVD) har vært brukt/brukes i ur industrien og de vil gi ulike egenskaper på Sveitserkniver. Det er ingen tvil om at Wenger har brukt tid og laget et gjennomført produkt fordi alle funksjoner, sideplater, skilleplater, nøkkelring og tannpirker + pinsett er sorte. Bruk av PVD på lommekniver er igjen som Wenger har vist innovativt. Min informasjon sier at de ble lansert tidlig i 2012 og er vist i 2012 katalog. Min er merket 09 2012 på eska som betyr at denne kniven er innen det året. The Blackout is in the list of the most special designs on SAKs. Not to forget that the slip-joint mechanism and springs are coated! I did some research on PVD and it is easy to find out that there is used different types of PVD coatings for different products. 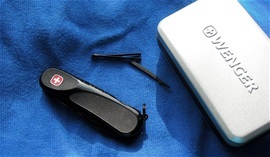 It is important on knives and multi-tools that the layer got minimal buildup. This is important for the functionality of the products with the durability. If a thick layer would get worn it would produce play in the functions. PVD is very good and it will have abilities well suited for SAKs or other product. PVD coatings can also have color or possibilities for an appearance for a certain look.